John has been working as a therapist and trainer for almost 20 years. He is a Registered Social Worker who holds a Master of Social Work degree. Much of John’s career has centred on working with children, youth, adults and families dealing with crisis and trauma. While he has a diverse practice, he has particular interest and specialized experience in working with individuals and families impacted by mental health concerns, violence, post-war trauma recovery, gender/sexuality issues, sexual abuse recovery and cyber-bullying/harassment. John’s work is also informed by his international experiences working with individuals and communities impacted by civil war and ethnic conflicts in Colombia, Albania and Northern Ireland. He is a warm and engaging facilitator who values interactive learning experiences. Mental health concerns will directly impact one in every five people. The remaining four will know a friend, family member, co-worker, or acquaintance that struggles with their mental health. 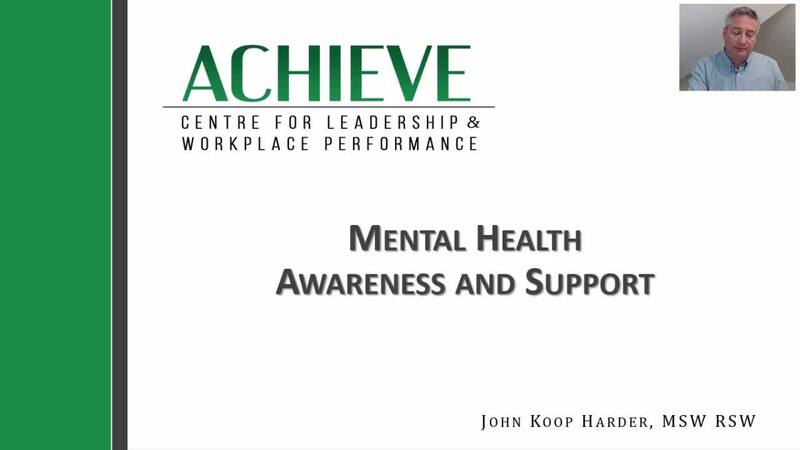 It is essential that organizations build capacity to support those with mental health concerns because early identification and support typically leads to continued employee wellbeing. This webinar will explore factors affecting mental health, give participants a general overview of common adult mental illnesses and, most importantly, how to be a support. Viewers will learn strategies for creating a more inclusive work environment that reduces stigma surrounding mental illness.